You place 1/4 cup of chia seeds, 3/4 cup water, 1 cup coconut cream , 1/4 cup raw cacao and 1/4 cup maple syrup in your http://www.Vitamix.com.au and blend up. Pour into a bowl and place in the fridge to set. Then pour 1 cup of coconut cream, desiccated coconut pieces and a sprinkle of chia into your vitamix and blend. Place in a bowl in the fridge to set. 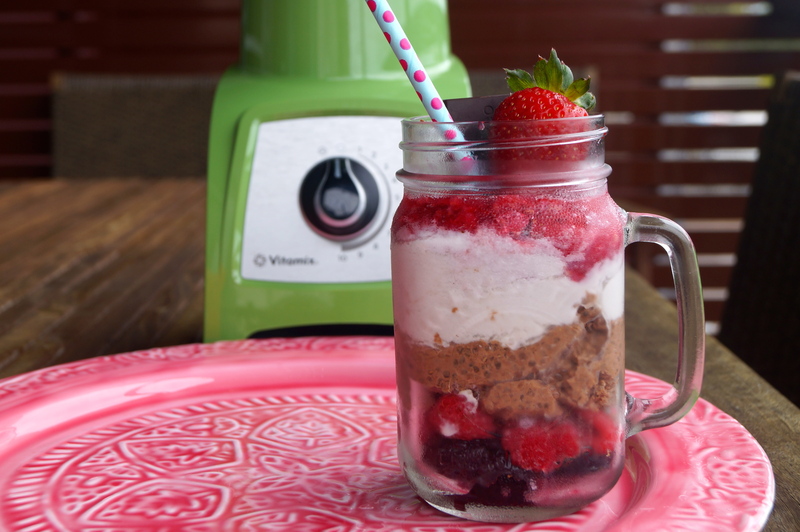 Once both are solid, get a jar a layer with cherries, raspberries, chocolate pudding, coconut cream mix and crushed strawberries and enjoy! !